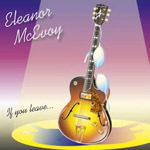 Share the post "Album review: ELEANOR McEVOY – If You Leave"
I’ve suggested in the past that I’d be happy to listen to Eleanor McEvoy sing the telephone directory – her soft lilting brogue is simply that addictive. Looking for my latest ‘fix’, even I was concerned about the direction of travel. The PR blurb promise of ‘neo retro blues’ (?) and the album artwork – a homage to the saucy seaside postcard artwork of the early 1900′s (an f-hole guitar entwined with a hastily discarded brassiere) made me wonder – had the solitude that peaked with ‘Alone’ (2011) finally found Eleanor staring into the abyss? While covers have been a staple part of her recorded output and live shows since ‘Early Hours’ (2004), ‘If You Leave’ features four, alongside eight ‘new’ compositions. The inclusion of Cyndi Lauper’s ‘True Color’s is no surprise – having been a regular feature of her live set over recent years, but The Beach Boy’s ‘God Only Knows’, ‘Lift The Wings’ from Riverdance, and Elmore James’ ‘Dust My Broom’ (covered by everyone from Ike and Tina Turner to Peter Green’s Fleetwood Mac) and are perhaps less expected. The blues have also been her intermittent companion since ‘Early Hours’, notably her marvellous interpretation of Chuck Berry’s ‘Memphis Tennessee’ on that album, and her self-penned ‘The Way You Wear Your Troubles’ on ‘Out There’ (2006). ‘If You Leave’ is, however, closest to ‘Love Must be Tough’ (2008) in terms of direction of travel despite being something of a patchwork quilt of material that includes a reworking of ‘Land In The Water’ – a Dave Rotheray ‘Life Of Birds’ collaboration, and ‘Secret Of Living’ – Eleanor’s ‘Only A Woman’s Heart’ 20th anniversary number featuring Mary Coughlan, Gemma Hayes, Hermione Hennessy and Sharon Shannon. But the creative inspiration for ‘If You Leave’ was the blues rock explosion of the 1960s, and in particular the Brian Jones’ story which sparked Eleanor into revisiting some of the classic albums of the genre by the likes of The Stones, The Beatles and The Beach Boys. While not attempting to recreate the era, syncopated echoes resound – in particular, the clean guitar playing of Jimmy Smyth, and the purity of James Delaney’s organ work resonate with the period, complementing the more fragile numbers where just a single instrument underpins Eleanor’s vocals. And it’s those latter moments that provide the more obvious highlights – aficionados will delight in the re-appearance and extraordinary piano playing of Brian Connor on ‘God Only Knows’ and ‘Lift The Wings’; and be equally enthralled by David Agnew’s sublime oboe accompaniment on ‘True Colors’. Of course, the vocals and audiophile quality throughout never falls short of the exacting standards that Eleanor and partner Mick O’Gorman have contrived to set since she broke free of record company chains and went ‘DIY’ with ‘Yola’ almost 10 years ago. This entry was posted in ALBUM REVIEWS, ALBUM REVIEWS (Mobile), All Posts and tagged acoustic, album, blues, Eleanor McEvoy, If You Leave, pop, review, rock, singer, songwriter. Bookmark the permalink. Pete Whalley’s reviews of Eleanor McEvoy are always spot on and this one is no exception. A great review of a great album.